Donggeochado (South Korea) (AFP) – Salvage operators began raising South Korea’s sunken Sewol ferry Wednesday, officials said, nearly three years after the disaster killed more than 300 people and dealt a crippling blow to now-ousted president Park Geun-Hye. Emotional parents of victims — the vast majority of the dead in the country’s worst-ever maritime tragedy were schoolchildren — urged people to pray for a successful recovery. The vessel was lying more than 40 metres (130 feet) below the waves off southwestern South Korea and the operation, originally scheduled for last year, had been pushed back several times because of adverse weather. It is thought that nine bodies still unaccounted for may be trapped inside the sunken ship, and raising the ferry intact has been a key demand of the victims’ families. “I am a mother who just really misses her daughter. Please pray for us so we can go home with Eun-Hwa,” said Lee Keum-Hui, one of a handful of relatives who have been living in makeshift homes at Paengmok, the closest port to the wreck, since the accident. “We will be grateful if you pray with us so that the last remaining victims can return to their families,” she said, breaking down. Other bereaved family members have been maintaining a vigil at a camp on a hilltop on Donggeochado, the nearest island to the site, just 1.5 kilometres away. Yellow ribbons — a symbol for the victims of the deadly disaster — hang on nearby trees, their colour faded by the course of time. In a tense atmosphere during the day, another father nervously watched through binoculars, trying to get a glimpse of the operation. Some 50 bereaved family members went out to sea by boat to watch the proceedings, he added. Two enormous barges were positioned on either side of the 6,825-tonne ship and air bags inserted for the salvage effort, which is being led by a Chinese consortium. Beams were installed by digging through the seabed underneath the wreck, which was lying on its side, and cables attached to bring it painstakingly towards the surface. Once two-thirds of it is exposed, a semi-submersible will be positioned underneath to raise it out of the water and transport it to the port of Mokpo to carry out investigations and search for the missing. A senior official from the maritime ministry said it took three hours to raise the wreck one metre off the seabed in what was initially a feasibility test. The ministry then decided to go ahead with the full lifting, it said in a statement. The operation is expected to take three days. The disaster and its aftermath gripped South Korea and overshadowed the presidency of Park, who stayed at her residence for seven hours in the crucial initial phase of the sinking. She has never specified what she was doing, sparking wild rumours including a tryst and cosmetic surgery. A permanent Sewol protest site targeting her was subsequently set up in the center of Seoul, with effigies of the head of state on display alongside pictures of dead schoolchildren. 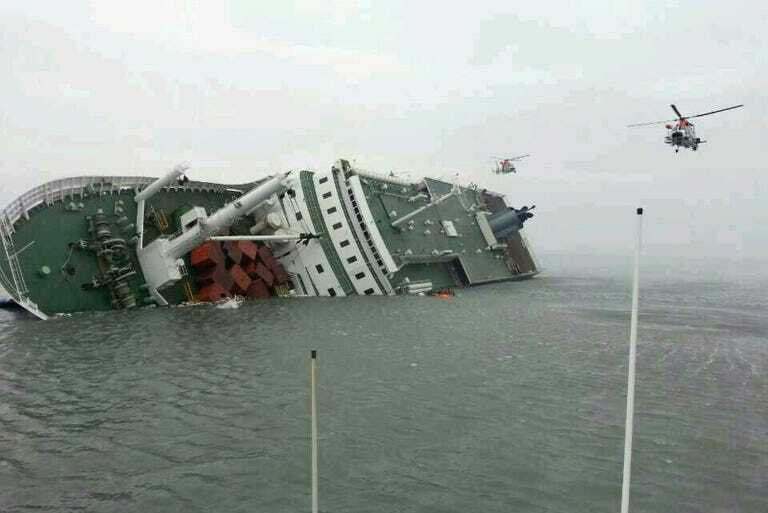 Negligence over the sinking was one of the grounds for which parliament impeached Park in December, although the constitutional court ruled that it was not an impeachable offense when it upheld her dismissal on other charges earlier this month. Donggeochado island has a population of only around 300, but the once-a-day ferry to it was packed with reporters Wednesday and at least one outside broadcast truck. Investigations into the disaster, in which 304 people died, concluded it was largely man-made — the cumulative result of an illegal redesign, an overloaded cargo bay, inexperienced crew and a questionable relationship between the ship operators and state regulators. Even though the vessel took around three hours to sink, those on board were never ordered to evacuate, while the crew escaped to safety. Captain Lee Jun-Seok was sentenced to life in prison for “murder through willful negligence” and 14 other crew members given terms ranging from two to 12 years.